Welcome to the world of Adele Bonny . . . a red-headed hottie and chaser of modern-day pirates who happens to get her inspiration, and inside information from history’s most famous female pirate to sail the Caribbean Sea from 1719 to 1722 . . . her own Great Aunt (13 times removed) Anne Bonny. Living in Nassau, Bahamas, a glamorous playground of the rich and famous, Adele has all the trappings of an enviable existence . . . the handsome husband, the beautiful boat, the gorgeous waterfront condo. But then, it’s all stolen from her, along with something much more important—her family’s fortune and heritage. 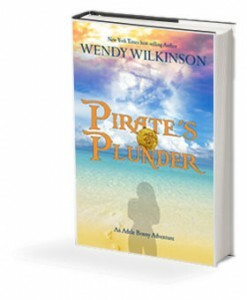 Faced with few options, Adele embraces her “inner buccaneer” and goes to work for Pirate’s Plunder, a small pirate booty retrieval company in downtown Nassau. There she meets a remarkable array of colorful characters. There’s her eccentric pirate clad partner, a real friend . . . or is he? There’s her best friend’s new boyfriend, a rakishly charming millionaire…or is he? There’s the handsome Navy SEAL, true love at last . . . or is it? And during her dangerous journey, Adele gets a glimpse of the woman she aspires to be . . . if only she can survive . . . Pirate’s Plunder.